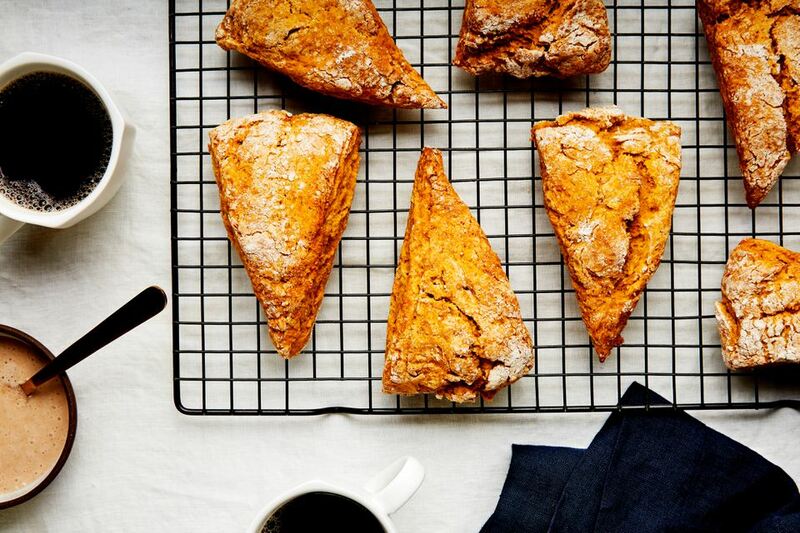 Nothing says fall like pumpkins, and these vegan pumpkin scones are the perfect snack or dessert when the weather has you thinking about crisp leaves, cozy fires, and sweater weather. These scones come out nice and moist, and they are spiced with ginger which leaves your kitchen with a wonderful aroma that smells of a heavenly, homey fall or winter. They're dense but not dry, and just as tasty as non-vegan scones. Fill your home with the aroma, then invite a friend over for a coffee date for a fall morning well spent! If you like vegan scones, you might also want to try these vegan chocolate chip scones or this recipe for vegan cranberry lemon scones. If you're a fan of all things pumpkin (all year round! ), check out this list of healthy pumpkin everything recipes, from risotto to pesto. In a large mixing bowl, combine dry ingredients (flour, sugar, baking powder, baking soda and ginger). Cut in vegan margarine, adding a bit at a time until mixed. Add pumpkin and combine well. On a lightly floured surface, knead the dough a few times, pushing it into a large circle, a few inches thick. Cut into 12 or so triangular pieces. Imagine you are cutting a pizza so that you get even, triangular slices. Transfer the slices to a baking sheet that's been lined with parchment paper. Bake at 425 F for 12 to 15 minutes, or until done. Serve warm with a bit of vegan butter and jam, or wait until the scones are cooled and enjoy dipped in a hot cup of coffee. These scones are lightly flavored with ginger, but if you like a spicier scone, try adding a bit of nutmeg, cinnamon, or allspice. Coconut oil can be substituted in place of vegan margarine. Be sure the oil is in its solid, scoopable state when using, not liquefied. Alternative flours such as oat flour, coconut flour, buckwheat flour, barley flour, or whole wheat flour may be used in place of all-purpose flour. However, different flours absorb moisture differently, and you can't always make a one to one measurement swap. If you choose to use an alternative flour in this recipe, you may need to experiment with amounts to acquire the desired scone consistency.